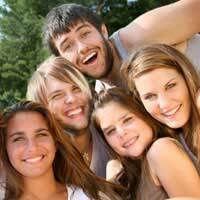 Youth groups can be excellent places for youngsters to meet new people, enjoy new experiences and learn about life. A youth group can empower kids and help them develop the important social skills they need to succeed in life and become a beneficial part of society. These social skills can be improved with some fun team building style ice breaker games. Including a few ice breaker games into a youth group session can build the group into a team and spark some important friendships, so have a look at some of these ideas and get the kids interacting. Split your group into teams (4 or 5 per team). Instruct the whole group to pull out everything in their pockets. They then have to try and make the alphabet out of the items they have by using the first letter of each item e.g. Brush = B, wallet = W, penny = P etc. The group that obtains the most letters from their items wins. This game encourages the group to work as a team. Start off with two participants standing back to back. Then ask them to lock their arms together. Instruct them to sit down and stand up without letting go of each others arms (this is a lot harder than it sounds). Every time they get to a standing position add another participant to the game. The more participants involved the harder the game becomes. This ice breaker game requires a lot of team co-operation and patience from the kids. This is a great game that encourages each team to help their team mates and improves communication and problem solving. This team building ice breaker is best played on the grass. Set out some buckets upside down and in a line, about 10 feet apart from one another. Then instruct the youth group to split into teams of however many buckets there are e.g. 5 buckets = 5 teams. Then explain that each team has to balance as many of their players on the bucket for as long as possible. The team who has the most players balancing at one time for the longest period wins. This game is especially good around Halloween but can be played any time. Purchase some pumpkins and cut them up into pieces (make sure the pieces are not too small). Next to the pieces of pumpkin place a set of wooden toothpicks. Once everyone is ready instruct the group to put the pumpkin together using the toothpicks. Give the group a set time limit and ask them to begin. The team with the pumpkin that has been best put together wins. This ice breaker is fantastic for team building and gives the kids a sense of accomplishment. These fantastic games are perfect for breaking down barriers between kids and help boost their confidence. Apply some team building ice breaker games to your youth group session and encourage the kids to interact whilst having fun. Why not try some more and get creative with ice breakers?